Hertfordshire's northeast corner feels far from the hurly-burly of 21st century life. There are long views across rich, rolling farmland, many meandering lanes that are in no hurry to get from village to village, and several rewarding churches. Among them are Meesden, Wyddial, Barkway, and Braughing, and to this list I'll add Anstey. Some Herts churches are disappointing when first seen, but Anstey delights from the start. Even before you enter the churchyard, pause and look at the lychgate. Nowadays, an extra prop has been inserted in the southwest corner; that only one is thought necessary is remarkable testimony to the workmanship of the builders half a millennium ago. 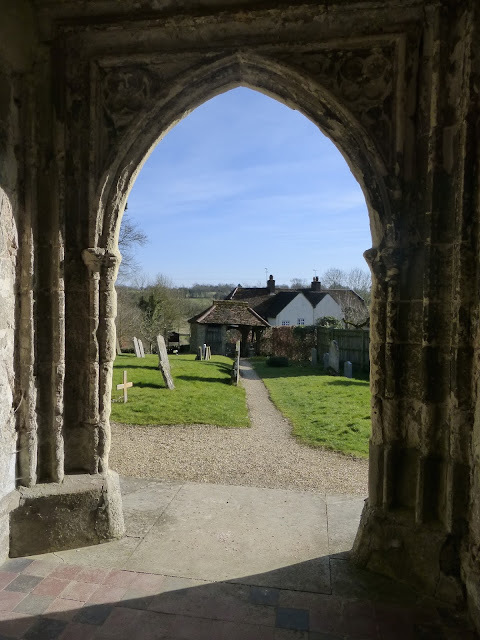 But that's not the whole story, because as you approach the lychgate you notice that the eastern third is no longer open but has been enclosed with flint and brick. This is puzzling at first; it's not at all normal for lychgates, the essential purpose of which was to shelter the corpse ('lic' in Old English) and funeral party as they rested on their way into the church, to have walls. It's not until you've gone through the gate and turned round that the strange truth reveals itself. There's only a single entrance and only a single window. The sole door is hefty, and the slit of a fanlight above it is barred. Extraordinarily, this portion of the lychgate has been converted into a lockup. * This happened in 1831; I don't know if there was a sudden outbreak of criminality in Anstey then that necessitated this metamorphosis. Committers of minor misdemeanours, such as drunkenness or petty theft, would have been imprisoned for a night or two, and perhaps occasionally more serious offenders would be kept there until officers arrived from Royston to take them into custody. Malefactors were caged there as late as the early 1920s, apparently. As far as I know, this is the only lychgate-lockup to be found anywhere. Once you've got over the surprise of the lockup, it's worth walking around the church before you go in. 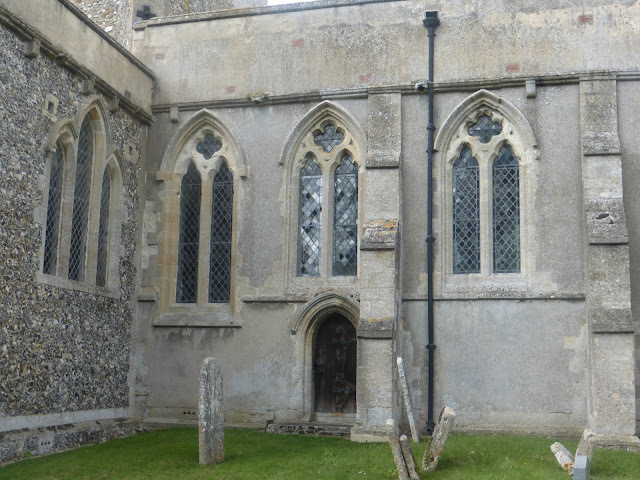 The west end, unlike that of many Herts churches, deserves to be called a west front; it's a symmetrical composition with late medieval windows (those of the north and south aisles have original but crumbling tracery, the bigger central window is a Victorian restoration). 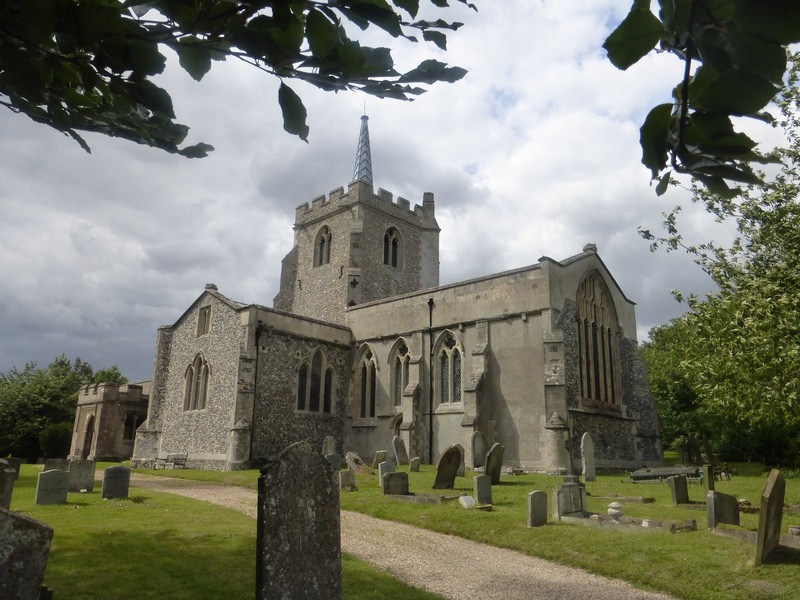 The nave, including the porch and the round quatrefoiled clerestory windows, is externally 15th century, or even early 16th century, and as such is very typical of Herts churches, but this means that another surprise is in store when we finally enter. The central tower, with the usual Herts spike (spirelet), and transepts create an impression of something approaching grandeur. The transepts and chancel are late 13th century, dating from that fascinating time when tracery was first being introduced into the upper portions of windows, and what we now know as the Decorated style was being formulated. The transepts look to me as if they're slightly earlier than the chancel. The photo above shows, on the left, the east wall of the south transept, and, on the right, the south wall of the chancel. The transept has a triplet of stepped lancets, tall, thin, sharply pointed windows, with no tracery, very typical of the 13th century (but not particularly common in Herts). The chancel windows on the other hand have plate tracery, a simple means, typical of the late 13th century, of elaborating and beautifying the building's elevations. All six north and south chancel windows are similar (though the large Perpendicular style east window is a Victorian restoration or insensitive insertion). The two westernmost windows on the north were cut in half when a vestry, now demolished, was built in the 14th century. One unusual but elegant feature of the transepts and chancel is that the lower stages of the diagonal buttresses are semi-circular, another example of how the masons of the era were willing to experiment in order to decorate their buildings. I have to admit that, despite my earlier recommendation to look around the exterior first, I rarely take my own advice and, if the door's open, go straight in. This is largely down to the superstitious fear that if I don't enter immediately someone will come along and lock up while I'm admiring the outside. (Not altogether superstitious, for I have occasionally been politely hurried by the arrival of keyholders eager to secure the church while I've been looking round the inside.) But, now we've electronically toured the outside, let's go in. Right in front of you as you go through the door is this fabulous (in both senses of the word) mermen font. It's assigned to the very late 12th or early 13th century by the Corpus of Romanesque Sculpture in Britain and Ireland; as it's so rude, almost primeval, I'd be inclined to think it somewhat earlier, but I wouldn't advise anyone to listen to my judgement on such matters (or on anything else, if it comes to that). It's been knocked around, and broken and stuck back together, in those eight hundred plus years; the faces of the four mermen - all similar, but not quite identical - have come off particularly badly. They each hold up the ends of their bifurcated tails, forming a compelling visual rhythm, and looking as if they're forming a protective barrier around the font. I've already said that the nave, judged by the exterior and in particular the windows, seems to date from the 15th century; however, the arcades are early 14th century, and odd. 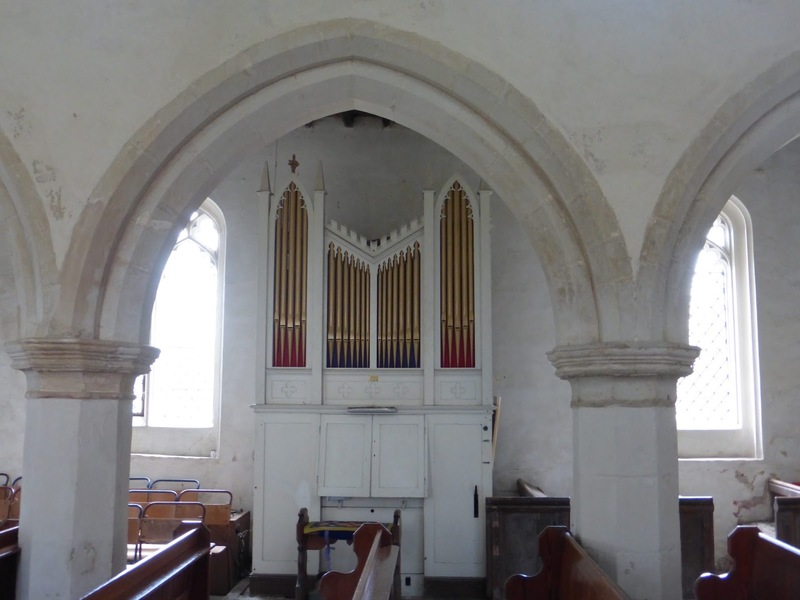 In Anstey, however, the arches of the nave arcade spring from the abaci at almost 45 degrees and curve only slightly, an unusual design feature. I don't think this experiment, creating as it does a jagged appearance, works nearly as well as the semi-circular buttresses. The four arches of the central crossing (under the tower) are even older. They're plain and Romanesque, so my first thought would be that they're earlyish 12th century. 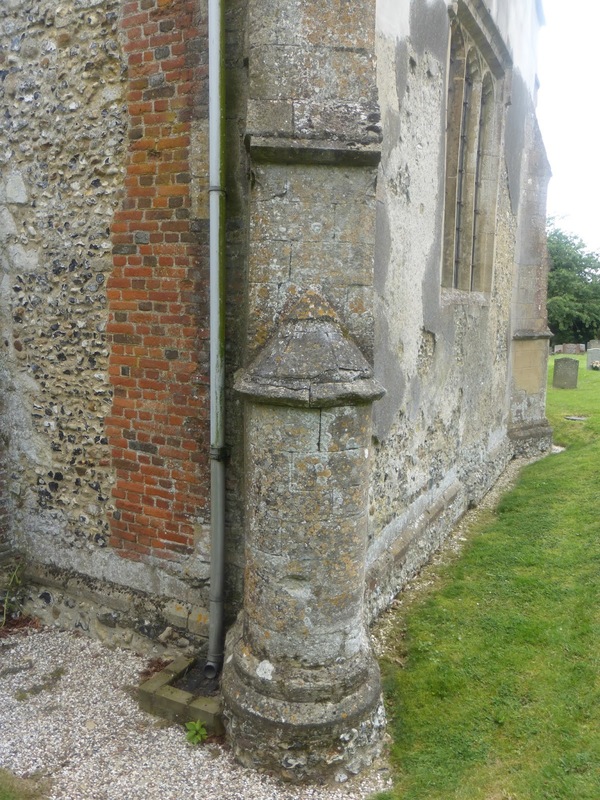 However, Pevsner convincingly argues for c.1200, on the grounds that shaft-rings (as seen on the mouldings around the west facing arches) were unknown in England until their use in Canterbury in 1175, and would have taken two or three decades to reach the provinces. It's notable that in Anstey the rings are of several different designs. Only the west facing arches, the ones that would most often be seen by the congregation, are decorated. The arch to the nave has very primitive and curious nearly spherical volutes with shallowly incised spirals, and leaf stems (now all but one broken) extending in a U-shape to an acanthus leaf. It's hard to believe that these ever looked very satisfactory. Another peculiar feature, unremarked on by the authorities, is the tall, thin niches between the shafts of the central crossing and the easternmost columns of the nave arcade. The one on the north has a cinquefoil head, while that on the south is septfoiled. What purpose do they serve, except to expose a little more of the quatrefoil columns and capitals? They don't look as if they're intended for statues. Perhaps they're purely aesthetic. View from the north transept into the nave. At the foot of the stairs is an old bier (19th century?). Pevsner calls the monument of c.1300 in the south transept 'exquisite', though it's so knocked around and crumbly that it's hard to really appreciate. On the day of my most recent visit it had mops and brooms propped against it. The most enjoyable bits are the beautifully carved naturalistic leaves on the capitals. The Decorated style had well and truly dawned. Each transept has an unusually large squint or hagioscope, through which the rites at the high altar could be followed. They're so big that they're almost like flying buttresses. The late 13th century chancel is full of light and interest. Each of the north and south windows is internally shafted, an impressive and probably expensive touch. The arrangement of the sedilia and piscina (which also incorporates the south door) is yet another little oddity of the church. The piscina has a little roof-like credence shelf in it (for the bread and wine before they were consecrated), and the easternmost seat of the sedilia has a canopy, as does the adjacent door. However, the two central seats, under the window, have no canopy, so there's a hole in the middle of the composition where there should be a focus. (Also the seat itself has a peculiar little upward kink in the middle). Pevsner speculates that the ensemble has been altered, but apart from the shelf, which may be a later addition, it's hard to see where. There are several label stops, and some fragments of painted scripts. There's also some graffiti, for example this of a knight. Despite his helm and two swords (or sword and dagger) somehow he looks playful rather than warlike. Misericords - small tip-up seats intended to provide a little rest for churchmen required to stand for a long time during services - aren't common in Herts; Bishops Stortford has the only major collection, though there are a few in Stevenage. Anstey, however, has a small but delectable selection. They date, like the chancel, from c.1300, so they were installed either when the east end was upgraded or soon after, assuming they have always belonged to the church and haven't been imported from somewhere else after the Reformation (which happened quite often). If they were indigenous to the church they would be quite unusual, parish churches having no pressing need for misericords. But, as we've seen previously, the people of Anstey didn't always do things as others do them. Misericords often gave the carpenters a chance to carve humorous scenes, or scenes from everyday life, and that's what happened in some of the examples here. A foliage design reminiscent of one of the label stops of the north door. A fan-like design. Could this be much later, for example 17th century? Oak leaves, very much like the National Trust logo. One of the advantages of writing a blog is that it gives you an impetus to find out about things that you've often vaguely thought about but never bothered to investigate. Thanks to this article I now know that the NT oak leaves symbol was designed in 1935 by Joseph Armitage (1880-1945), who also carved, for example, the memorial plaque to W G Grace outside Lord's cricket ground. And now you, dear reader, know this too, and don't you feel all the better for it? Two gloved arms resting on a trefoiled arch, the columns and capitals of which are carved in great detail. On the gloves sit hawks, with strange trefoiled tails looking like the empennage of a submarine. The hawk on the left doesn't seem very hawkish. A lively grotesque head (male or female? ), with tongue sticking out, furrowed brow, long hair and eyes looking off to his or her right. Some grotesques seem designed to look alarming (sometimes comically so), but this one seems more alarmed than alarming. Two hooded men with foliage between them. They each have a raised arm, as if they're shaking their (miniscule) fists at each other. Their faces however are neutral, not angry. Stiff-leaf foliage, a simple but striking design. It's by Patrick Reyntiens (b 1925), whose works I'm most familiar with are his collaborations with John Piper (1903-92), such as the superb baptistery window in Coventry cathedral (the first modern stained glass I was awed by, in about 1978) and the lantern lights in Liverpool's Catholic cathedral. But he also works independently (there are three other windows by him in Herts, all in Datchworth church). The window is a memorial to the American airmen of the 398th Bombardment Group who were stationed at nearby Nuthampstead airbase from April 1944 to June 1945. They flew B-17 bombers, often known as Flying Fortresses; 293 lost their lives doing so, and their names are inscribed on the wings of the numerous butterflies. You can read more about it here (which repeats some of the same information). The butterflies and, at the top of each light, birds ascend, as do the planes on the left as they make height in preparation for crossing the Channel and attacking Germany. But the planes on the right descend, two of them at horribly vertiginous angles from which they'll very likely not recover. The shard-like triangles of red and yellow suggest the explosions of shrapnel from the anti-aircraft gunfire and the searchlights, both of which are malevolently hunting for the planes. The right light evokes horror, death and destruction, while that in the centre tries to offer solace by suggesting hope in an afterlife. Only a dozen miles away, the last flying B-17 in Europe is based at Duxford. This beautiful, dramatic and moving window ends our tour of the church with a wonderful chromatic climax. Anstey church has always been open whenever I've visited. There's much to see and enjoy, including examples of Norman architecture and the three main stages of Gothic (Early English, Decorated and Perpendicular), together with some objects of delight. It won't disappoint. * The statutory listing states that 'the wallplate at the NE corner has head mortice for a corner-post and brace, suggesting that a timber-framed enclosure or lockup preceded the flint-walled one.' However, if the watercolour illustrated above, presumably painted a decade or so before the conversion into a lockup, can be relied on as an accurate portrayal, the lychgate was previously an open structure with no walls. 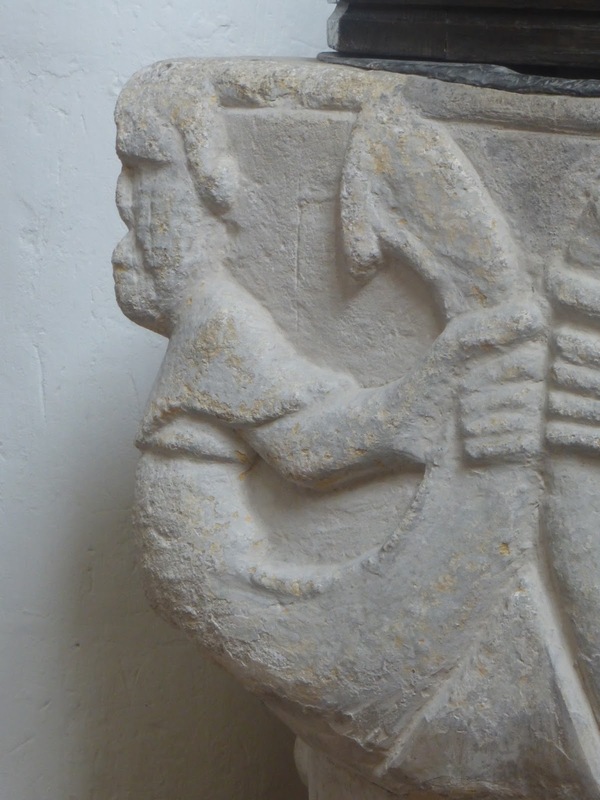 ** Pollard, when discussing the font (which, incidentally, he dates to the very early 12th century), doesn't mention the mermen interpretation, although it was certainly known at the time. Unfortunately Anstey's font doesn't feature in Paley's Illustrations of Baptismal Fonts (1844), so we can't know, at least from this source, how early Victorians viewed it. (The only two Herts fonts featured in the volume are Abbots Langley and Sandridge.) However, at least two other Edwardian books do read the figures as being mermen (and don't mention the ark/ship interpretation). Bond's Fonts and Font Covers (1908) (which dates it to the late 12th or early 13th century) simply states that the figures are mermen; the Royal Commission on Historical Monuments volume covering Hertfordshire (1911) describes them as 'curious figures of two-tailed mermen or figures holding up cloths, late 12th century.' The mention of cloths suggests that perhaps other interpretations of the font may yet emerge; a future age may see it in another light. The font of St Peter's, Cambridge, which as I've pointed out is very similar to Anstey's, makes an earlier appearance in the antiquarian literature. In 1812 it was illustrated in Grieg and Storer's Ancient Reliques, which refers to 'figures, in some respects representing mermen or mermaids'. The words 'in some respects' shows the authors slightly hedging their bets, but they don't offer any other interpretation. We might deduce that before the Victorian resurgence of enthusiastic Christianity most were content to admit that pagan symbols were to be found even on the most sacred objects in a church, while by the later 19th century such a possibility was unthinkable, at least among the clergy. But even if there's some truth in this deduction, I'm sure there are so many exceptions to the rule that it can hardly be called a rule at all. 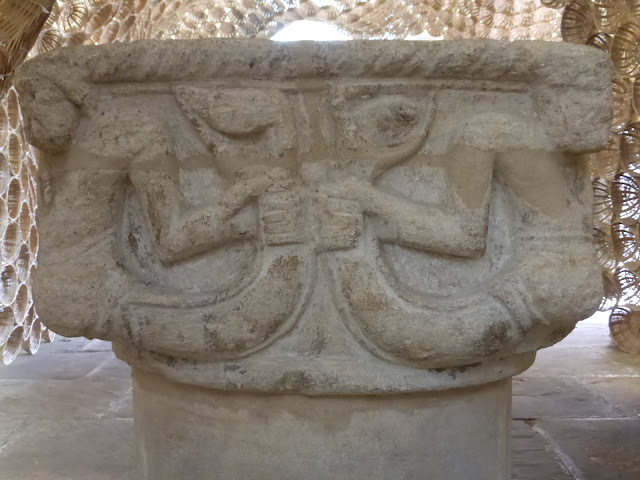 I've written about St Peter's font here.